(Nanowerk News) Physicists use the Boltzmann equation to calculate the statistical distribution of the particles in a conventional gaseous system. Attempts to apply the equation to so-called “active” gases consisting of self-propelled particles have, however, run into considerable technical difficulties. A group of physicists led by Erwin Frey, who holds the Chair of Statistical and Biological Physics at LMU Munich, has now developed a numerical approach to the solution of the Boltzmann equation for active systems. The new method is reported in the new edition of Physical Review X ("Numerical Treatment of the Boltzmann Equation for Self-Propelled Particle Systems"). 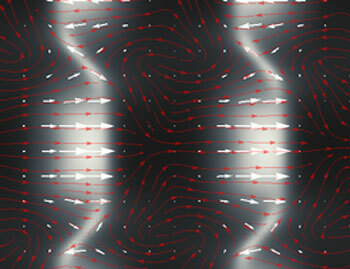 The novel pattern in which clusters of active particles arrange themselves into parallel lanes and neighboring streams flow in opposite directions. Systems consisting of active matter play a prominent role in a highly diverse collection of biological phenomena on widely different scales, ranging from subcellular networks of biopolymers to spatially extended flocks of migratory birds comprising thousands of members. Unlike the particles that make up conventional gases, whose behavior is subject only to the laws of Brownian motion, the constituents of active gases are self-propelled and mutual interactions are very often highly dissipative. These properties form the basis for the ability of such systems to give rise to a fascinating array of collective phenomena. Examples include the behavior of fish swarms or of the huge herds of gnu that undertake seasonal migrations over the plains of East Africa. The latter collectives are able to follow a given route in the absence of specialized navigators or specific landmarks in the savannah. “In principle, the Boltzmann equation provides a useful tool with which to elucidate the unusual collective dynamics of such systems, but its mathematical structure greatly complicates its application to active systems. We propose a conceptionally new approach to tackling the problem,” says Florian Thüroff, a doctoral student in Erwin Frey’s group, and first author on the new study. The LMU researchers have designed an algorithm that allows them to investigate the collective phenomena that emerge in these systems on the basis of certain properties of the individual particles of which they are composed. In addition, the LMU team also discovered unexpected patterns of collective behavior in systems of active particles that undergo binary, polar interactions. Previous work had shown that particle systems that exhibit ordered motions organize themselves into extensive wave-like bands. With the aid of their new algorithm, the Munich researchers found surprising patterns characterized by the emergence of large clusters in which the particles segregate into “traffic lanes” and neighboring streams flow in opposite directions. This result is highly remarkable because, in contrast to previously described ordered phases in such systems, these patterns do not directly reflect the symmetry of the underlying particle interactions,” Thüroff points out. The new algorithm should find application in a wide variety of contexts. For instance, it allows active systems to be described in a framework other than that employed to understand the behavior of so-called open systems. This in turn should greatly facilitate comparisons with experimental data.